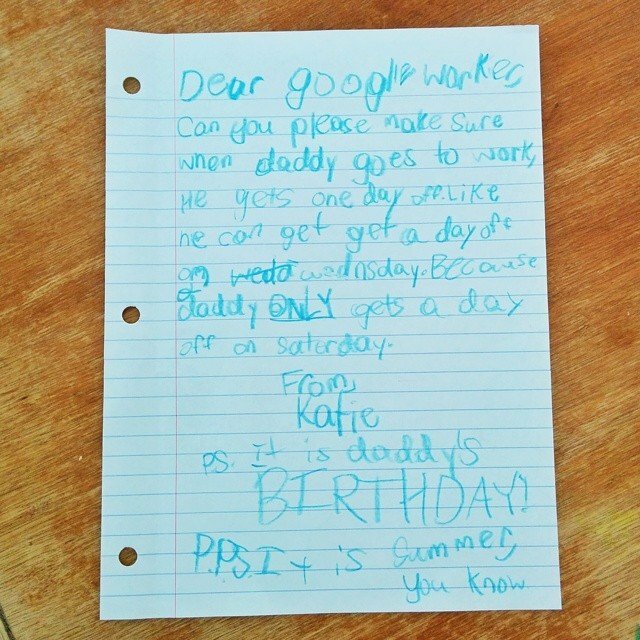 Here’s some advice on how to get some time off from work: Have your daughter send a really cute letter to your employer, asking them to give you a day off. Bonus points if the letter is written in crayon. One little girl decided to give her dad a hand. She wrote his employer, which happens to be Google, a letter, asking that they cut him some slack with the work schedule. Can you please make sure when daddy goes to work, he gets one day off. Like he can get a day off on Wednesday. Because daddy only gets a day off on Saturday. Perhaps it was the crayon, or perhaps it was that final nudge about it being summer, but Google obliged. 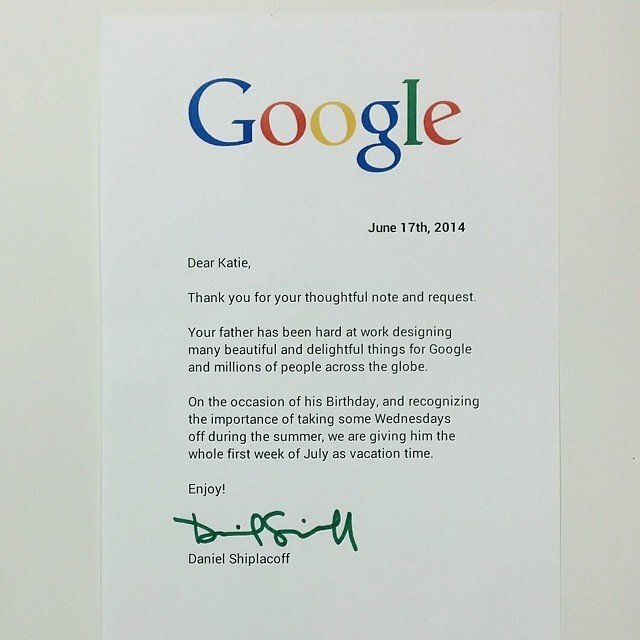 In a letter back to Katie, her dad’s boss, Senior Design Manager Daniel Shiplacoff, not only complimented Katie’s dad on his hard work, but also gave him a bonus week off. Since it is summer, after all. A Google spokesman confirmed to The Blaze that the letter is, in fact, the real deal. Cool stuff. Even the ones at the top of the ladder have a heart – sometimes. Heartarming . Thank you . That is nice, Greetings from Germany! Innocence speaks better than anything else! My gosh. What a touching post. Little girl writes to the titan of the tech world and her wish was granted. Commendable act by the Daniel, and Katie gets her dad on his birthday. Cute and adorable post. Thanks for sharing, It is emotional post which teach us that parent and kids must spent some time together. Let me get this straight – this man gets only one day off a week for as long as his child can remember, and the Google execs are saints for giving him some of those second days of the weekend back in comp time?